Lunch can be a precarious meal to partake in while at Walt Disney World. For starters, you want to make sure you still have an appetite for several rounds of afternoon snacking. Plus it’s smack dab in the middle of the day, that critical time when you don’t have a moment to waste in your planned assault on a park. There are those times, however, that I like to sit down, relax and really enjoy the luxury that is lunch. For those of you who have the same desire, or for those of you who are trying to rehabilitate your ‘must ride everything as fast as possible’ mentality, let me introduce you to the Tandoori Chicken Salad from Sanaa in Disney’s Animal Kingdom Lodge – Kidani Village. Now, if you’re like me the first thought you have when you hear the words ‘chicken salad’ is some sort of cubed or shredded chicken tossed in a mayonnaise based dressing with bits of vegetables, but the Tandoori Chicken Salad couldn’t be further from this. In fact, it is an actual salad! The chicken is whole pieces, thighs mostly, of chicken set upon a bed of watercress and romaine with tomatoes and quinoa, tossed in a honey shallot dressing. Aside from not being a traditional chicken salad, it also does not include any filler iceberg lettuce that could be easily used for filler in a salad. The chicken is tender and juicy, but has the terrific crackly exterior that comes from being prepared in the tandoori oven. The greens are fresh and give a hint of mint and a bit of bitterness that makes them tingle in your mouth while providing a hearty base for the salad. The pearls of quinoa add another layer of texture to the meal as they coat both the greens and diced tomatoes. What can I say about the honey shallot dressing except that its sweetness plays well against the savory of the chicken and the bite of the greens. Additionally, the salad is not drowning in dressing which shows a clear understanding that Sanaa’s kitchen knows just how to handle their ingredients and toss them together. We’ll talk about what a treat lunch can be at Sanaa on another day, but it should suffice today to know that Sanaa is a perfect place to rest for more than a few moments while you partake in a midday meal. 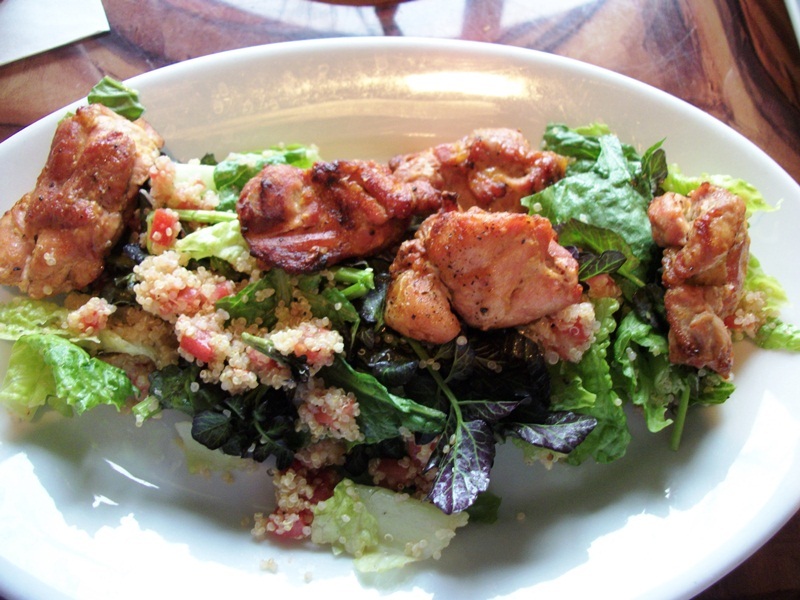 The Tandoori Chicken Salad is refreshing and will not weigh you down as you plot your afternoon. Of course, once you start slowing down, there’s no telling where you’ll end up!